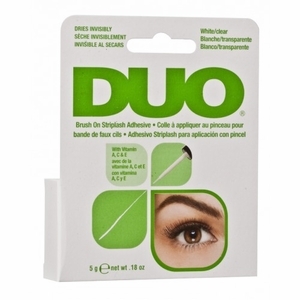 Duo Eyelash Adhesives Now in Healthy Latex Free Formula safe for contact wearers and sensitive eyes, enriched with vitamins. Contains ultra thin brush for quick application. Duo Eyelash Adhesives Now in Healthy Latex Free Formula safe for contact lens wearers and sensitive eyes. Vitamins A, C and E.